My Double Sided Pattern Paper came from my paper stash I have at home. I love the different prints. 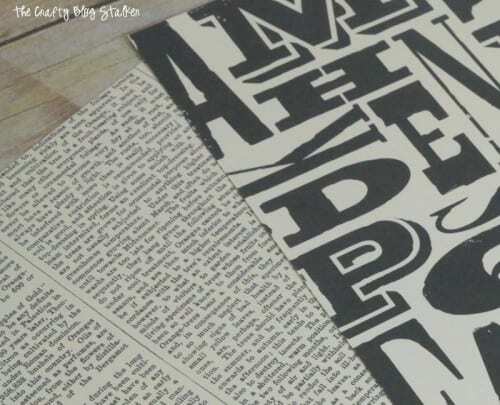 Large random letters on one side and newspaper print on the other. 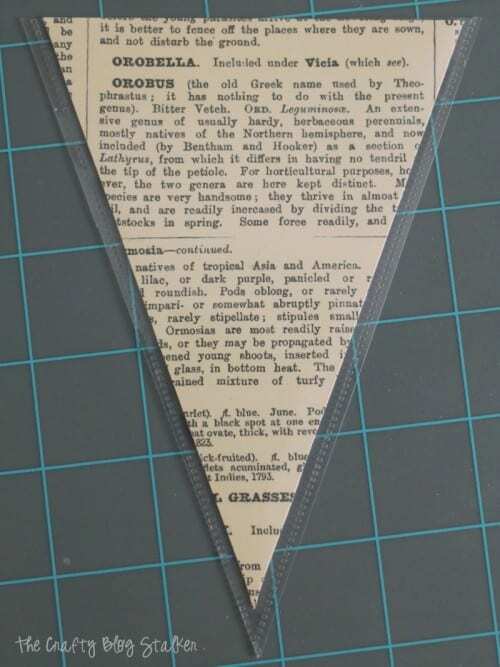 First, cut your banner pieces from the triangle end of the Banner Punch Board. Make as many as you need for your word. For my banner, I needed 6. Line the paper at the 5.5-inch line and cut your banner. Cut your sheet protector into 6×6-inch squares and keep them the front and back together so you basically have two layers of the sheet protector. Use one of the banner pieces as a pattern and place under both layers. 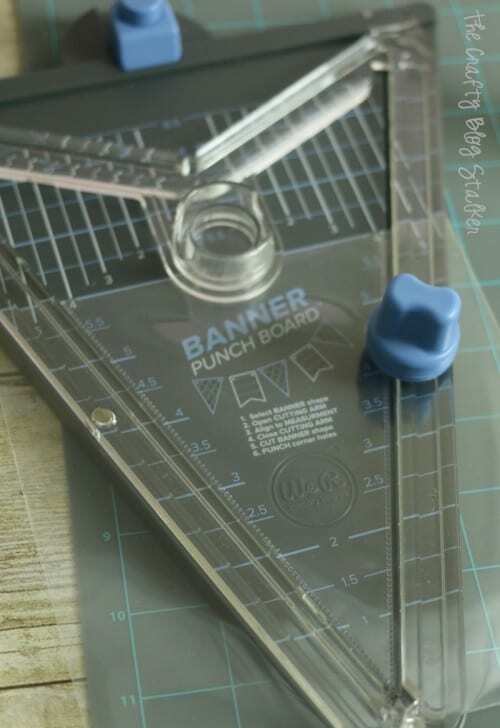 Using the Fuse ruler as a guide create a seam around the two edges of the banner piece, leaving the top open. You can see in the picture below the seams that were created with the Fuse tool. Line up the seams inside the Banner Punch Board so that the seams are inside the cutting track. This should put your protector sheets at about the 6-inch line in the Banner Punch Board, and cut. When the plastic banner is cut out slide one of the paper banners inside. Some of the paper banners may need to be trimmed to give you room to seal the top of the plastic banner. I had to trim the banner in the picture below because it was too long and didn’t give me that space. 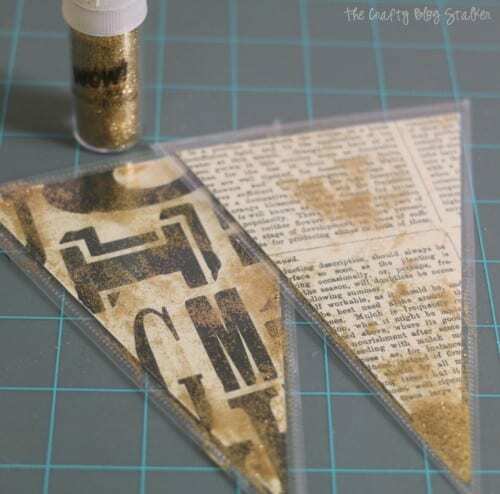 Add a couple dashes of glitter to the inside of the plastic banner pieces, making sure to get it on both sides of the paper if the banner is going to be double sided. 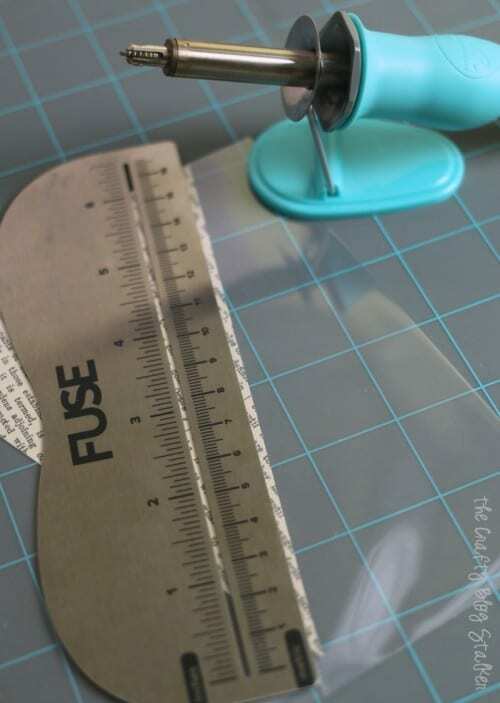 Then seal the top with the Fuse and ruler. Using my Big shot and alphabet dies, I cut two sets of letters so that my banner could be double sided. Here you can see what both sides of the banner look like. I love how all of that loose glitter inside the sleeves and it sparkles and shines when the light catches it. 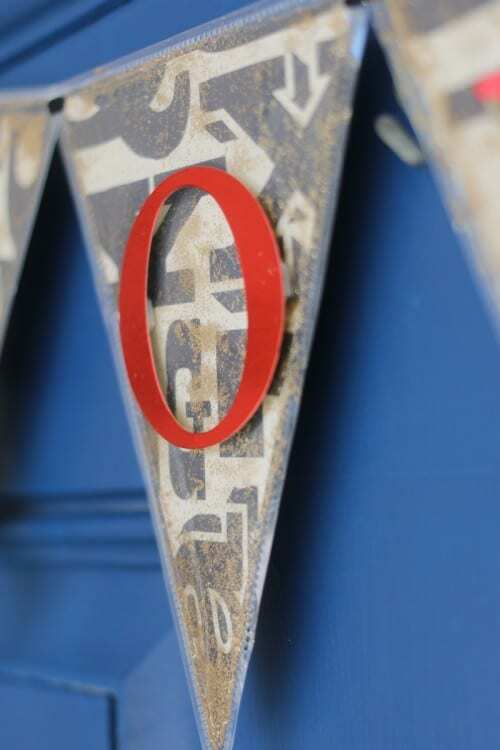 Use a Crop-A-Dile to punch small holes in the upper corners of the banner pieces and string with some thin black ribbon. I hung mine on my door. Since my paper is protected with the plastic sheet protectors I am not as worried about the outside elements. I the Fuse doesn’t seal the paper inside 100% but it does give it some added protection. Plus the plastic sleeves allows me to turn each banner piece into a shaker with the glitter. I love how all of that loose glitter looks inside the sleeves and it sparkles and shines when the light catches it. 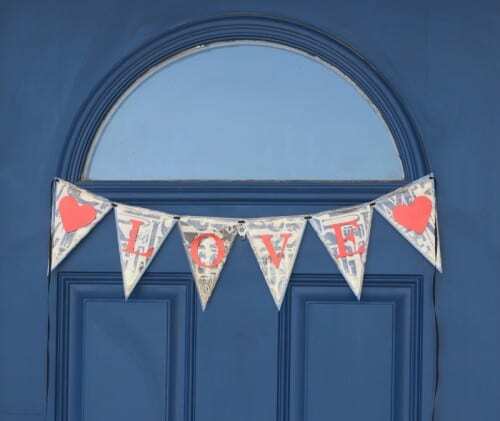 Where will you hang your fun Glitter Shaker Banner and what will it say? 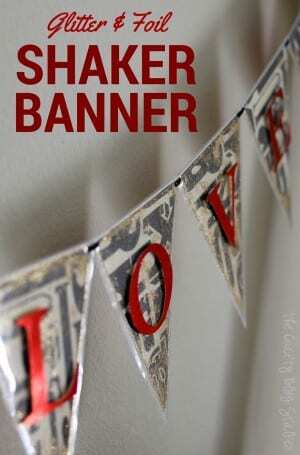 Share this Glitter & Foil Shaker Banner to Pinterest by clicking on the image below. So cool! I didn’t even know you could make a plastic sleeve! I love everything about it…those plastic sleeves are so cool!!! Wow, this is very cool. A lot of this is new to me – never knew you could make your own plastic sleeve, the fuse ruler, etc. Thanks for the great info. You are welcome Suzy! The Fuse tool is one of my favorites! Wow, I had no idea you could make a plastic sleeve nor have I ever seen the banner cutter (which is now on my Must Buy List). How clever Katie! 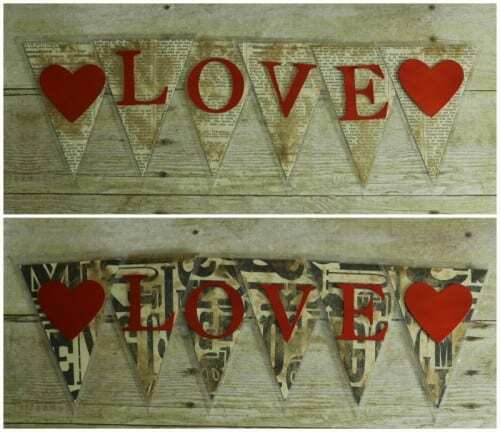 I love banners too, for decorating and anything really! But you’ve taken this one to the next level, how professional and how great to be able to have it outside! You are one equipped girl, I love that banner punch board, so cool! This is adorable! Such a cute look for the door too. Thank you for sharing with us at Brag About It. Pinned and tweeted to share! Wanted to pop back over to let you know that your project will be featured at next week’s Brag About It Link Party! Hope you can join us. Party starts Monday at midnight. Awesome! Thank you so much Laurie! I love your creative mind! I have never thought of doing this, I want to make some banners now! 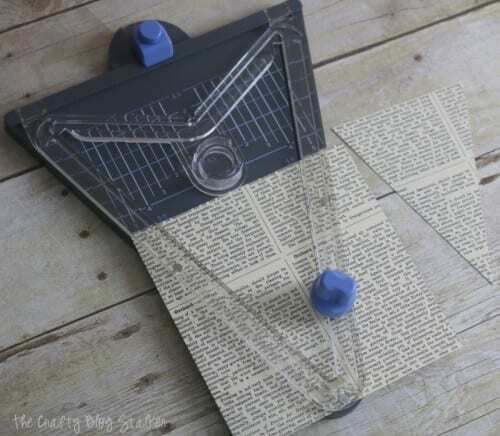 I really like your idea of using newspaper print. Something about it just speaks to me! Thanks for sharing this awesome craft! Love your banner, very creative! Great tutorial! Thank you Marilyn! I am so glad that you found it useful. Hi Katie, I absolutely love your banner video and I’m so inspired by all your creations! I sure hope Stampin’ Up! will offer us the punchboard because I would love to add that to my collection. Happy Valentine’s Day thanks for all your awesome crafting ! Thank you so much Lynn. It is a really fun punch board! What a great decoration. It’s really creative and effective. I love it. No pun intended! This is suuuuuper cute! Love the glitter! Thank you for sharing at my craft party!! Be sure to link up again every Thursday at 7pm EST. I’ll pin every instructional post! So cute and so fun! I have been thinking about making a banner that says SPRING for on my mantel. I didn’t even know about these tools you used! I will be checking this out. I am pinning this to my party decor board! Thank you so much for coming by Celebrate Your Story. I hope we see you again this week. The party opens at 8:00 PM on Saturday night! I am so glad that you like the banner, Deborah! It is a fun one to make!